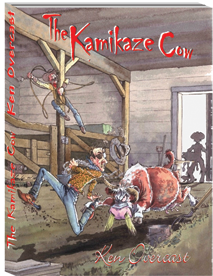 The Kamikaze Cow is one of those little stories that just has to be seen to be fully appreciated. Although working cowboys can relate on an entirely different level than folks that haven’t been in a similar situation, you’re sure to get a bang out of this video of a live performance by Will Rogers Award-winning cowboy, Ken Overcast. Available on DVD from Bear Valley Records.